With any home purchase, it’s important to figure out exactly what you want and need in a home to make smart decisions. But a waterfront home is not just any home. Special considerations need to be taken to ensure that your property will suit your lifestyle and let you enjoy the activities you love. Use this article to help you get on the right track to buying your dream waterfront home. This is probably the most critical part of looking for waterfront property. When potential waterfront home buyers come to Fenton or Linden, the first step is finding out how they want to use the property. The most important thing is determining what their passions are, what they care about, and what their priorities are when it comes to waterfront living. From there, we can figure out what lake they need to be on and focus in on specific properties. This is a huge factor in choosing a waterfront property because you’ll want to choose a property that makes it easy for you to enjoy your favorite pastimes. Fishing. Fishermen will want to stick to properties with easy access to the water. For a wider variety of fish, buyers should also look for deep bodies of water that support cold water fisheries. Some great fishing lakes in the Fenton and Linden area would be Lobdell Lake, Silver Lake, and Lake Ponemah. Kayaking or canoeing. While large, active bodies of water are a good fit for many boaters, some buyers may be looking for a more intimate waterfront experience. If they want to go kayaking and canoeing and commune with nature, they may not enjoy being on a big, busy lake with jet skis and all that stuff like Lake Fenton. Some properties aren’t meant for year-round use. On Lake Fenton, there are several homes on Case’s Island, these homes a great for summer, spring, and fall use but there is not a bridge to access the island so winter access is limited. There are several people that enjoy the island life as it is a less expensive way to enjoy the water and have family retreats. What other lifestyle needs do you have? Do you like to entertain on the lake? If you like to entertainer you there are also some other things you need to consider. Does the home have a floor plan that will accommodate a lot of people being able to communicate? A lot of the homes on lakes in Fenton and Linden Michigan started out as small cottages that have been built on over the years. When you have homes that have additions or multiple additions sometimes you end up with walls where they normally wouldn’t be making it difficult to talk entertain large groups. Another important thing to consider when you are looking at your next waterfront house is parking. For example, some homes on Lake Fenton & Lake Ponemah that have very deep lots with plenty of parking but some do not. Some homes will have an extra lot across the street where they can put another garage and place extra cars. But some streets like parts of Torrey Rd, Sonora Dr, and Dart on Lake Fenton have very limited due to the homes sometimes being built on 20 ft lots. Rolston Rd on Squaw lake and propose some challenges as well If you are low key with a small family parking will not be as big of an issue but if you like to have party’s and entertain you really need to think about it. Sometimes even if your waterfront home does not have a lot of its own parking you can park on the street if it is a slow street but some of the streets are fast moving lined with houses and it cannot only be challenging to do so it can also be dangerous. As with any other real estate purchase, the old adage holds true: location, location, location. After determining your needs in a waterfront home, it’s important to visit different areas and see what feels right for you. As much as owning a waterfront home is great you still need to love the community you are in. Once you focus on a certain lake or lakes and start looking at specific properties, it is important to remember is to put equal emphasis on the property and the house. If you’re buying a normal house, the real value is in the house, not the land but with waterfront properties, a majority of the value is in the land, not the house. In some cases depending on the home all the value is in the land, that’s why you see so many cottages torn down and large homes built in their place. Not all waterfront properties are equal; certain attributes make some waterfront properties more valuable than others. When helping clients shop for waterfront homes in Michigan there are several things to look for. Sandy beach. A sandy beach equals a more pleasant lakefront experience for the whole family. If they have young kids in the family, they want the toddlers playing in the sand, If they have seniors in the family, it’s easier to enter the water. View. This attribute lets you enjoy your waterfront property as you get older and become less active in the water. It’s sure nice to be able to sit back in a lawn chair with a beer and look at the setting sun over the trees and lake. Level lot. The flatter the lot the better; it makes access to the water easier. Some lakefront lots are steep, and as we get older, it gets difficult to get up and down to the lake. All of a sudden they don’t want to go to the lake anymore because it’s difficult for them to get down to the water. Also with elevated lots, you often have an added expense of maintaining retaining walls. Proximity to water. Some municipalities have a certain setback from the neighbors and water so if you are going to rebuild a home you need to account for these things. Also, homes that are closer to the water allow you to be closer to wildlife and to keep an eye on your kids from the house. Privacy. This often corresponds to the amount of Lake Frontage the property has. Some lakefront properties have as little as 20 feet of frontage, which offer very little privacy. The wider the lot is the more space you have for trees and fences to give you privacy from the neighbors. Depending on the area and the type of waterfront home you buy, other issues will present themselves in your search. In rural areas, for instance, you’ll have to make sure you have access to utilities, roads, and an adequate septic system. Don’t just assume these things will be available. 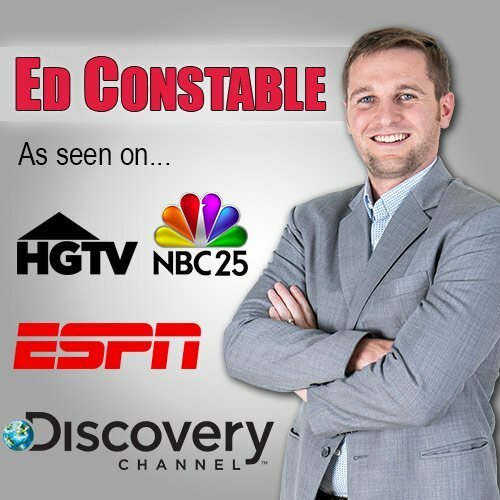 With all of the considerations that go into buying a waterfront home, having a real estate agent who specializes in waterfront homes in your area like Ed Constable is crucial. Your agent can help you sort through the complex issues and get you on the right track to finding the right waterfront home. If you are looking for a waterfront home is Genesee, Livingston, or Oakland County’s contact Ed Constable. Ed Constable lives on the biggest lake in Genesee County (Lake Fenton) has been on several of the other lakes in the counties he serves. To browse for waterfront homes in Michigan and browse for homes by lake visit LakefrontKing.com or start your search below.